The Rabbi with a Blog (Rabbi Jason Miller): Sacha Baron Cohen Hits Ryan Seacrest with Kim Jong Il's Ashes: Funny or Disrespectful? Sacha Baron Cohen Hits Ryan Seacrest with Kim Jong Il's Ashes: Funny or Disrespectful? 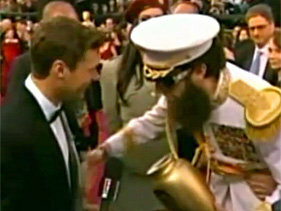 Sacha Baron Cohen of course made a scene before tonight's Oscars when he arrived on the "Red Carpet" in character as General Aladeen, the star of his upcoming movie "The Dictator." Carrying the fake ashes of the late North Korean dictator Kim Jong Il, Baron Cohen dumped the ashes onto Ryan Seacrest. As he walked away, he told Seacrest that when asked "Who are you wearing?" he should answer "Kim Jong Il." It was meant as a prank and a publicity stunt. And like most of Sacha Baron Cohen's publicity stunts, it worked. People will be talking about it on Monday morning and that will ultimately result in a larger box office take for "The Dictator." Watching the footage of Baron Cohen comically spilling the fake ashes of a dead dictator onto Ryan Seacrest reminded me of a similar scene from the season premier of "Two and a Half Men" this season. The new season began with Jon Cryer’s character Alan being surprised at seeing a soaking-wet Walden Schmidt (Ashton Kutcher) appearing at the Malibu house window and then tossing Charlie Sheen's character's ashes into the air. The ashes are later stepped on and then vacuumed. The spilling of a dead person's ashes in error is an old comedy routine (remember Robert DeNiro's mother's ashes falling off the mantle in "Meet the Parents"? ), but I still found it troubling. Sacha Baron Cohen dumping Kim Jong Il's ashes on to Ryan Seacrest and Jon Cryer throwing Charlie Sheen's ashes into the air were both funny and I laughed. However, it also made me think of how we should respect the dead. According to Jewish law, cremation is prohibited. We believe that dead bodies should return to the ground. Admittedly that could have had something to do with my discomfort at watching the scene from "Two and a Half Men." Interestingly, I wasn't as troubled watching the "Weekend at Bernie's" movie in which a dead corpse is paraded around the beach for a few days. The comedic gags with spilled ashes and a dancing corpse are one thing. They are meant to be humorous. However, we should remember the ethic of respecting the dead. K'vod ha-met in the Hebrew refers to the Jewish law of treating the deceased with honor. I have never attended Bodies: The Exhibition in which preserved human corpses are preserved and dissected to showcase the way the body's systems work. I understand that it is for educational purposes, but purchasing a ticket to such a "show" has struck me as odd. It seems a disrespectful way to treat the dead. What also comes to mind when I think about how we must honor and respect the dead is the recent published photograph by the National Enquire of a dead Whitney Houston lying in her coffin. I understand that the goal of this tabloid is to sell copies of their paper to make money, but this immediately struck me as crossing the line of decency and appropriateness. Journalistic integrity and responsibility is becoming harder to find these days, but the National Enquire should have refused to purchase this photograph. Publishing it on the front page of the tabloid was disrespectful to Whitney Houston's family and was certainly a violation of the edict to respect the dead. While I am uncomfortable even seeing fake ashes being used as a joke, I certainly understand how Sacha Baron Cohen was attempting to get shock value out of his stunt at tonight's Academy Awards and how "Two and a Half Men" was making a joke (and perhaps a statement about Charlie Sheen). Where I think our society needs to tread more cautiously is when actual dead bodies are used inappropriately. The Bodies exhibit has been very successful for many years despite some people's criticism of it. While I don't plan to ever buy a ticket and attend this exhibition, I do understand how it can be an educational endeavor. However, the case of Whitney Houston's dead corpse being published on the front page of a tabloid newspaper (and then all over the Internet), is a shame. No matter how curious our society might be to see such a photograph, I hope more tact will be displayed in the future so that dead bodies (no matter what form they take) will be respected and honored. Sacha Baron Cohen was going for sensationalism tonight at the Oscars and he clearly understands how death gets our attention. rabbi, i am living in Asia as you know and here in Asia Cohen's self PR jokes do not go over well and they create bad images of Jews for Asian people. AND you are so right, no matter how bad a dictator he was, we should respect all national leaders, as human beings. Except for Hitler of course. I was suprised Rabbi that you did not mention Cohen's called the Academy of Motion Pictures, "the Zionist Academy of Motion Pictures in Hollywood" on his Youtube protest video. Again, funny on one level, and yet in Asia and overseas among people who do not understand Cohen or Jewish history or Jewish comedy, and among Neo Nazis in USa, they seize on this crap and use it again Jews. IMHO, Cohen should shut up and retire. he is a disgrace to the Jewish people. Who does he think HE is? Cohen's problem is that he is a British Jew and grew up in a totally different Jewish environment than Americans Jews and he lives in a nation that has very different views about Jews than USA Christians do. So he is really from another planet and should keep his act in London. It does not play well in Peoria, which is where my dear Grandma Bella lived after marrying Max in Boston after coming over on the boat from Poland.